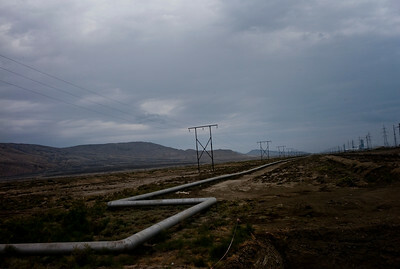 August 2011, Azerbaijan - Landscape with pipeline and portrait of Heydar Aliev outside of Baku. Since it became operational in 2006 the Baku Tbilisi Ceyhan oil pipeline has allowed Azerbaijan to export its oil to world markets through Georgia and Turkey, thus avoiding Russia. It has considerably strengthened good neighbourly relations between Georgia and Azerbaijan, although at the expense of both nations' relations with Russia. 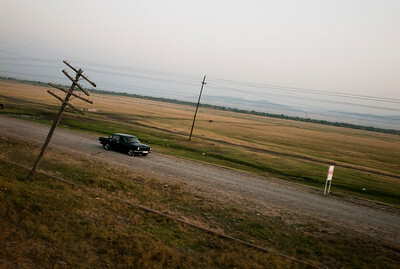 August 2011, Azerbaijan - View from the Tbilisi-Baku train. Since it became operational in 2006 the Baku Tbilisi Ceyhan oil pipeline has allowed Azerbaijan to export its oil to world markets through Georgia and Turkey, thus avoiding Russia. It has considerably strengthened good neighbourly relations between Georgia and Azerbaijan, although at the expense of both nations' relations with Russia. August 2011, Azerbaijan - BP terminal at Sangachal, a place where BTC pipe line begins and the oil and gas get transported to the west. Since it became operational in 2006 the Baku Tbilisi Ceyhan oil pipeline has allowed Azerbaijan to export its oil to world markets through Georgia and Turkey, thus avoiding Russia. It has considerably strengthened good neighbourly relations between Georgia and Azerbaijan, although at the expense of both nations' relations with Russia. 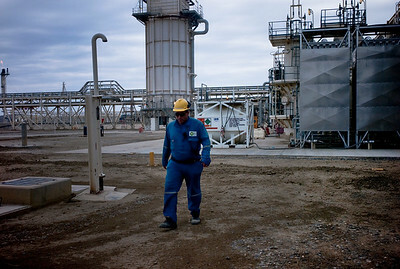 August 2011, Azerbaijan - An operator seen at the BP terminal in Sangachal, a place where BTC pipe line begins and the oil and gas get transported to the west. Since it became operational in 2006 the Baku Tbilisi Ceyhan oil pipeline has allowed Azerbaijan to export its oil to world markets through Georgia and Turkey, thus avoiding Russia. It has considerably strengthened good neighbourly relations between Georgia and Azerbaijan, although at the expense of both nations' relations with Russia. 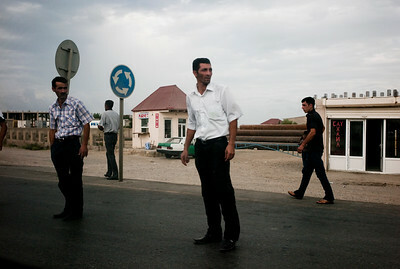 August 2011, Azerbaijan - Pipe line seen outside of BP terminal at Sangachal. Since it became operational in 2006 the Baku Tbilisi Ceyhan oil pipeline has allowed Azerbaijan to export its oil to world markets through Georgia and Turkey, thus avoiding Russia. It has considerably strengthened good neighbourly relations between Georgia and Azerbaijan, although at the expense of both nations' relations with Russia. August 2011, Azerbaijan - Oil rigs owned by the State Oil Company of Azerbaijan Republic (SOCAR) seen outside of Baku Since it became operational in 2006 the Baku Tbilisi Ceyhan oil pipeline has allowed Azerbaijan to export its oil to world markets through Georgia and Turkey, thus avoiding Russia. 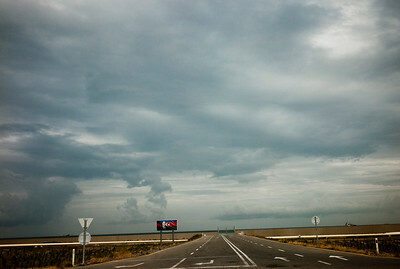 It has considerably strengthened good neighbourly relations between Georgia and Azerbaijan, although at the expense of both nations' relations with Russia. August 2011, Batumi, Georgia One of the last remaining old style cafes in the Black Sea tourist resort of Batumi. Batumi has been undergoing intensive development since the end of the 2008 Georgia-Russia war. Many of the new five star hotels cater to the oil rich Azeris from across the border who are flush with petrodollars flowing from the Baku-Tbilisi-Ceyhan oil pipeline. 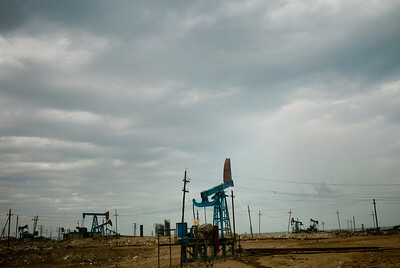 Since it became operational in 2006 the BTC has allowed Azerbaijan to export its oil to world markets through Georgia and Turkey, thus avoiding Russia. It has given Azerbaijan a greater sense of independence and a new role for Georgia in Europe's energy security to the annoyance of Russia. Some blame the BTC for Russia's continued covert involvement in regional latent conflicts especially the South Ossetian crisis which led to the Russia-Georgia war. 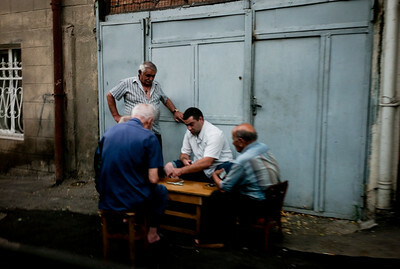 August 2011, Baku: Men playing board game on the streets of Baku. Since the oil has begun to flow through the Baku-Tbilisi-Ceyhan (BTC) oil pipeline, a new rich elite has sprung up in Baku. The disparities between rich and poor are however still enormous. 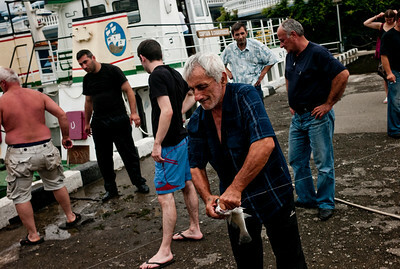 August 2011, Batumi, Georgia Men fish near the harbour in Batumi from where some of the oil from caspian sea gets transported to different parts of europe and beyond. 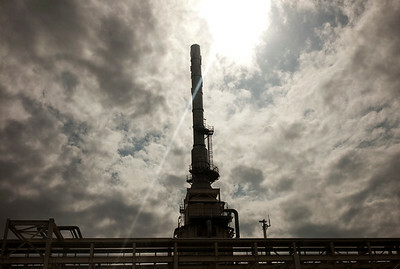 Since it became operational in 2006 the BTC has allowed Azerbaijan to export its oil to world markets through Georgia and Turkey, thus avoiding Russia. It has given Azerbaijan a greater sense of independence and a new role for Georgia in Europe's energy security to the annoyance of Russia. Some blame the BTC for Russia's continued covert involvement in regional latent conflicts especially the South Ossetian crisis which led to the Russia-Georgia war. August 2011, Azerbaijan - Street scene near Baku. Since it became operational in 2006 the Baku Tbilisi Ceyhan pipeline has allowed Azerbaijan to export its oil to world markets through Georgia and Turkey, thus avoiding Russia. It has given Azerbaijan a greater sense of independence and a new role for Georgia in Europe's energy security to the annoyance of Russia. Some blame the BTC for Russia's continued covert involvement in regional latent conflicts (Abkhazia, South Ossetia, Nagorno Karabakh). 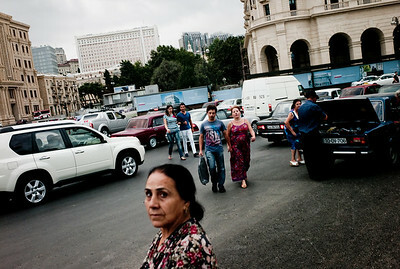 August 2011, Azerbaijan - The new facade of Baku. High-end cars and botique shops spring up every day in this city which aims to be known as the next Dubai. Since it became operational in 2006 the Baku Tbilisi Ceyhan pipeline has allowed Azerbaijan to export its oil to world markets through Georgia and Turkey, thus avoiding Russia. It has given Azerbaijan a greater sense of independence and a new role for Georgia in Europe's energy security to the annoyance of Russia. Some blame the BTC for Russia's continued covert involvement in regional latent conflicts (Abkhazia, South Ossetia, Nagorno Karabakh). August 2011, Tbilisi, Georgia: Commuters seen at the Train station in Tbilisi. Since it became operational in 2006 the Baku Tbilisi Ceyhan oil pipeline has allowed Azerbaijan to export its oil to world markets through Georgia and Turkey, thus avoiding Russia. It has considerably strengthened good neighbourly relations between Georgia and Azerbaijan, although at the expense of both nations' relations with Russia. August 2011, Baku, Azerbaijan The new skyscraper city can be seen emerging in the background, while the smaller houses in the foreground are set for demolition. Since the flow of money has poured into Baku thanks to the Baku Tbilisi Ceyhan (BTC) oil pipeline, the Azeri capital has gone through intensive redevelopment. 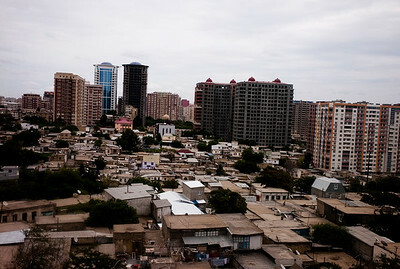 However human rights organisations criticise the way in which inhabitants of old Baku have been forcefully evicted from homes earmarked for demolition with inadequate compensation. 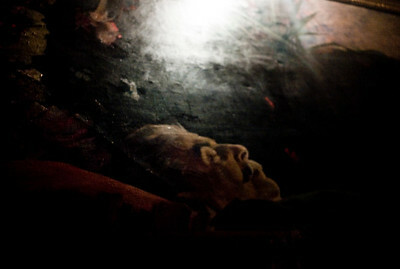 August 2011, Gori, Georgia: Photograph of an oil paint - Dead Stalin in the Stalin Museum in Gori, Georgia Since it became operational in 2006 the Baku Tbilisi Ceyhan oil pipeline has allowed Azerbaijan to export its oil to world markets through Georgia and Turkey, thus avoiding Russia. It has considerably strengthened good neighbourly relations between Georgia and Azerbaijan, although at the expense of both nations' relations with Russia. 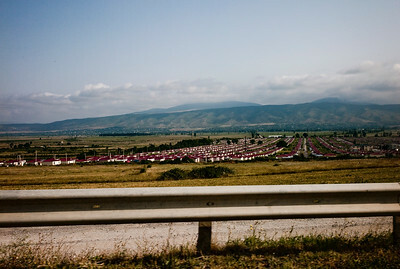 August 2011, Tbilisi, Georgia: Camp for South Ossetian refugees settled along the route of BTC pipeline. Since it became operational in 2006 the Baku Tbilisi Ceyhan oil pipeline has allowed Azerbaijan to export its oil to world markets through Georgia and Turkey, thus avoiding Russia. It has considerably strengthened good neighbourly relations between Georgia and Azerbaijan, although at the expense of both nations' relations with Russia. 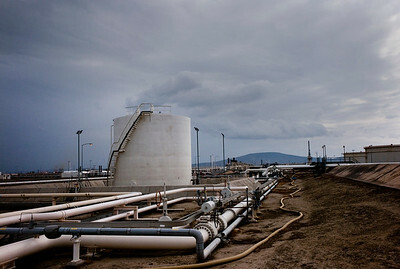 August 2011, Baku, Azerbaijan: Oil field with number of rigs, owned State Oil Company of Azerbaijan Republic (SOCAR). Since it became operational in 2006 the BTC has allowed Azerbaijan to export its oil to world markets through Georgia and Turkey, thus avoiding Russia. It has given Azerbaijan a greater sense of independence and a new role for Georgia in Europe's energy security to the annoyance of Russia. Some blame the BTC for Russia's alleged continued covert involvement in regional latent conflicts (Abkhazia, South Ossetia, Nagorno Karabakh). 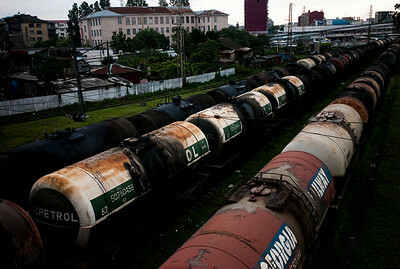 August 2011, Georgian - Azeri border Oil train transporting oil from Baku to the Georgian Black Sea terminal of Batumi. Until the construction of the Baku Tbilisi Ceyhan (BTC) pipeline this was one of the only ways to export Azeri oil to world markets without going through Russia. 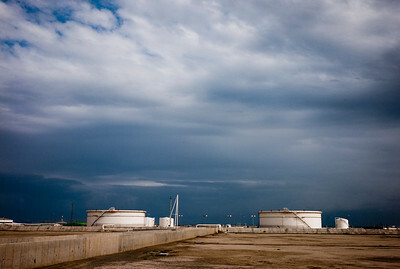 Since it became operational in 2006 the BTC has allowed Azerbaijan to export its oil to world markets through Georgia and Turkey, thus avoiding Russia. It has given Azerbaijan a greater sense of independence and a new role for Georgia in Europe's energy security to the annoyance of Russia. Some blame the BTC for Russia's alleged continued covert involvement in regional latent conflicts (Abkhazia, South Ossetia, Nagorno Karabakh). 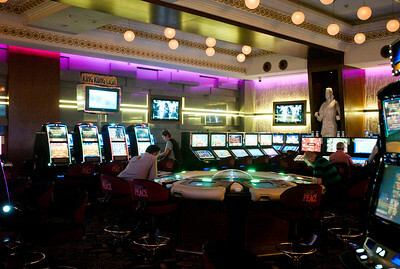 August 2011, Batumi, Georgia: Casino in Batumi, where tourists from Armenia, Iran,Azerbaijan, Israel and Turkey gamble alongside of Georgians. Since the money has begun to flow from the Baku-Tbilis-Ceyhan (BTC) oil pipeline, designer shops and expensive hotels and restaurants have sprung up in Baku. The disparities between rich and poor are however still enormous. August 2011, Batumi, Georgia: Diplomats see at a conference on Georgia's integration with Europe. 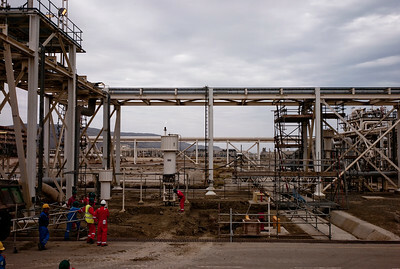 Since it became operational in 2006 the BTC has allowed Azerbaijan to export its oil to world markets through Georgia and Turkey, thus avoiding Russia. It has given Azerbaijan a greater sense of independence and a new role for Georgia in Europe's energy security to the annoyance of Russia. Some blame the BTC for Russia's alleged continued covert involvement in regional latent conflicts (Abkhazia, South Ossetia, Nagorno Karabakh). August 2011, Batumi, Georgia: Wealthy Georgians seen at Party in Batumi. Since the money has begun to flow from the Baku-Tbilis-Ceyhan (BTC) oil pipeline, designer shops and expensive hotels and restaurants have sprung up in Baku. The disparities between rich and poor are however still enormous. August 2011, Batumi, Georgia - High class 'model' in the nightclub of the Sheraton hotel. Batumi has been undergoing intensive development since the end of the 2008 Georgia-Russia war. Many of the new five star hotels cater to the oil rich Azeris from across the border who are flush with petrodollars flowing from the Baku-Tbilisi-Ceyhan oil pipeline. 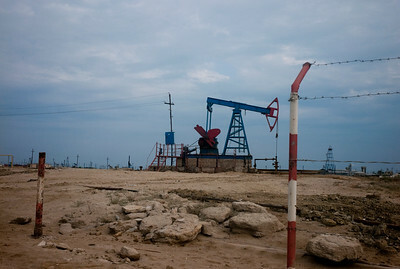 Since it became operational in 2006 the BTC has allowed Azerbaijan to export its oil to world markets through Georgia and Turkey, thus avoiding Russia. It has given Azerbaijan a greater sense of independence and a new role for Georgia in Europe's energy security to the annoyance of Russia. Some blame the BTC for Russia's continued covert involvement in regional latent conflicts especially the South Ossetian crisis which led to the Russia-Georgia war. 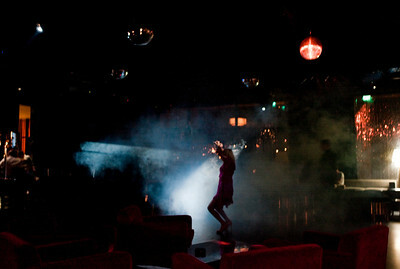 August 2011, Baku: Young women, who could either be members of the new rich elite or high class prostitutes, about to enter an exclusive Baku restaurant. Since the money has begun to flow from the Baku-Tbilis-Ceyhan (BTC) oil pipeline, designer shops and expensive hotels and restaurants have sprung up in Baku. The disparities between rich and poor are however still enormous. August 2011, Baku, Azerbaijan Baku's iconic "Flame Towers" emerging in the background, while the smaller houses in the foreground are set for demolition. Since the flow of money has poured into Baku thanks to the Baku Tbilisi Ceyhan (BTC) oil pipeline, the Azeri capital has gone through intensive redevelopment. However human rights organisations criticise the way in which inhabitants of old Baku have been forcefully evicted from homes earmarked for demolition with inadequate compensation. August 2011, Dortyol, Aqdam region, Azerbaijan - Abdullah Gurbanov, village of Dortyol, Agdam region, Azerbaijan. The Agdam region is on the border of the Nagorno Karabakh enclave, controlled by Armenia since 1994 and claimed by Azerbaijan. In spite of a cease fire brokered in 1994 skirmishes between Azeris and Armenians are an almost daily occurence. 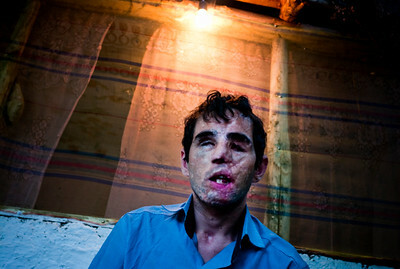 In 2008 Abdullah Gurbanov, 23, was injured by a shell fired by Armenians. He lost both eyes and half his face was blown off. In spite of cosmetic surgery scars still disfigure his face. 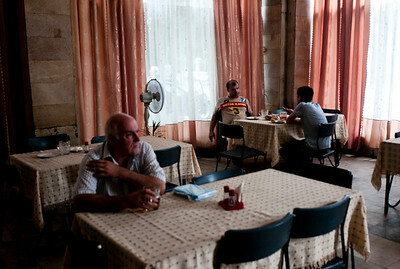 August 2011, Baku, Azerbaijan One of the many residents in Baku evicted from their homes due to the new developments. Since the flow of money has poured into Baku thanks to the Baku Tbilisi Ceyhan (BTC) oil pipeline, the Azeri capital has gone through intensive redevelopment. However human rights organisations criticise the way in which inhabitants of old Baku have been forcefully evicted from homes earmarked for demolition with inadequate compensation. 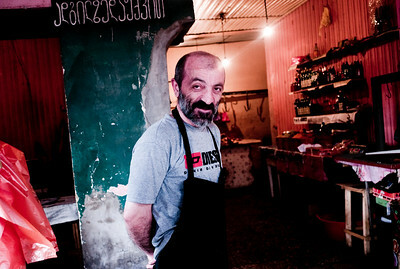 August 2011, Tbilisi, Georgia - Portrait of a butcher in Tbilisi, where the oil money has the divided the rich and power in a larger extent. Since 2006 the BTC has allowed Azerbaijan to export its oil to world markets through Georgia and Turkey, thus avoiding Russia. It has given Azerbaijan a greater sense of independence and a new role for Georgia in Europe's energy security to the annoyance of Russia. Some blame the BTC for Russia's continued covert involvement in regional latent conflicts especially the South Ossetian crisis which led to the Russia-Georgia war. August 2011, Batumi, Georgia: Man and a kid swim in the ocean, where an oil tanker can be seen in the background, Batumi a port town known for its Oil tranport. Since the flow of money has poured into Baku thanks to the Baku Tbilisi Ceyhan (BTC) oil pipeline, the Azeri capital has gone through intensive redevelopment. 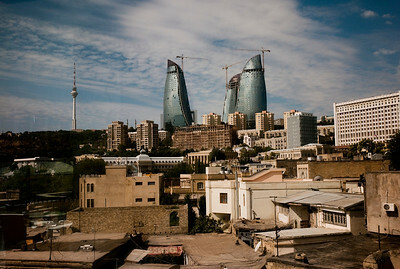 However human rights organisations criticise the way in which inhabitants of old Baku have been forcefully evicted from homes earmarked for demolition with inadequate compensation. August 2011, Batumi, Georgia: Young women sun bathe on the pebbled beach in Batumi. Since 2006 the BTC has allowed Azerbaijan to export its oil to world markets through Georgia and Turkey, thus avoiding Russia. It has given Azerbaijan a greater sense of independence and a new role for Georgia in Europe's energy security to the annoyance of Russia. Some blame the BTC for Russia's continued covert involvement in regional latent conflicts especially the South Ossetian crisis which led to the Russia-Georgia war. 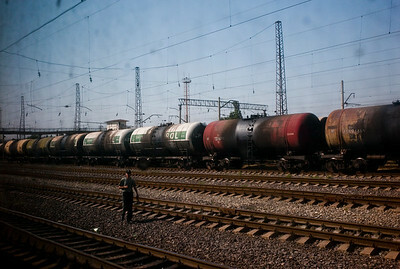 August 2011, Batumi, Georgia: Oil tankers being transported from Caspian sea to Batumi by rail. Since 2006 the BTC has allowed Azerbaijan to export its oil to world markets through Georgia and Turkey, thus avoiding Russia. It has given Azerbaijan a greater sense of independence and a new role for Georgia in Europe's energy security to the annoyance of Russia. Some blame the BTC for Russia's continued covert involvement in regional latent conflicts especially the South Ossetian crisis which led to the Russia-Georgia war. August 2011, Batumi, Georgia: Manager of a Casino with his staff in Batumi. Since 2006 the BTC has allowed Azerbaijan to export its oil to world markets through Georgia and Turkey, thus avoiding Russia. It has given Azerbaijan a greater sense of independence and a new role for Georgia in Europe's energy security to the annoyance of Russia. Some blame the BTC for Russia's continued covert involvement in regional latent conflicts especially the South Ossetian crisis which led to the Russia-Georgia war. August 2011, Dortyol, Aqdam region, Azerbaijan - Young men in the refugee camp, believed to be getting trained to fight the armenians in Nagorno Karabakh. The Agdam region is on the border of the Nagorno Karabakh enclave, controlled by Armenia since 1994 and claimed by Azerbaijan. In spite of a cease fire brokered in 1994 skirmishes between Azeris and Armenians are an almost daily occurence. 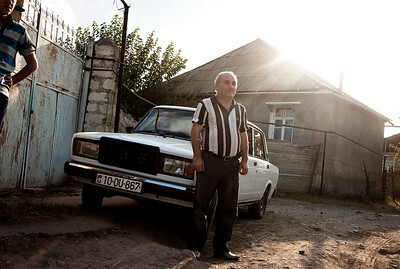 August 2011, Ganja, Georgia: A farmer with his new car, which he purchased using the money given to him by the BTC consortium to let them use his land to lay the underground pipeline. Since 2006 the BTC has allowed Azerbaijan to export its oil to world markets through Georgia and Turkey, thus avoiding Russia. It has given Azerbaijan a greater sense of independence and a new role for Georgia in Europe's energy security to the annoyance of Russia. Some blame the BTC for Russia's continued covert involvement in regional latent conflicts especially the South Ossetian crisis which led to the Russia-Georgia war. 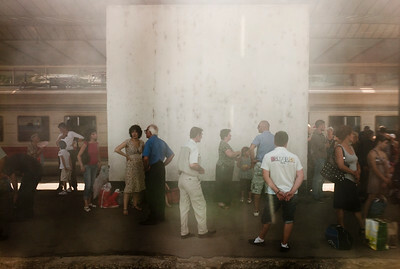 August 2011, Batumi, Georgia: Tourists from Armenia board the Armenian train in Batumi. The new oil money has helped Batumi to grow its tourism industry and now attracts tourists from neighbouring Armenia, Azerbaijan, Turkey, Iran and Israel. August 2011, Kutaisi, Georgia: Women walk from the monastery in the rain Since 2006 the BTC has allowed Azerbaijan to export its oil to world markets through Georgia and Turkey, thus avoiding Russia. It has given Azerbaijan a greater sense of independence and a new role for Georgia in Europe's energy security to the annoyance of Russia. Some blame the BTC for Russia's continued covert involvement in regional latent conflicts especially the South Ossetian crisis which led to the Russia-Georgia war. 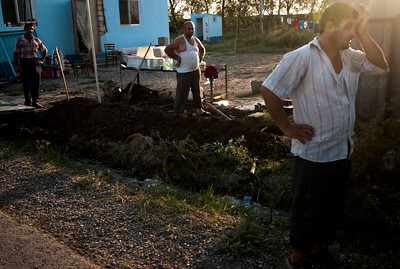 August 2011, Tbilisi, Georgia: Grand mother kisses her grandson at their home in the refugee camp for south Ossetian refugees. Since 2006 the BTC has allowed Azerbaijan to export its oil to world markets through Georgia and Turkey, thus avoiding Russia. It has given Azerbaijan a greater sense of independence and a new role for Georgia in Europe's energy security to the annoyance of Russia. Some blame the BTC for Russia's continued covert involvement in regional latent conflicts especially the South Ossetian crisis which led to the Russia-Georgia war. 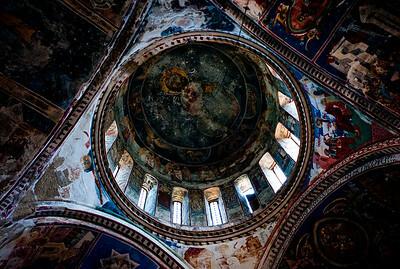 August 2011, Gory, Georgia: Paintings of christ seen in an orthodox monastery near Gori, Georgia. Since 2006 the BTC has allowed Azerbaijan to export its oil to world markets through Georgia and Turkey, thus avoiding Russia. It has given Azerbaijan a greater sense of independence and a new role for Georgia in Europe's energy security to the annoyance of Russia. Some blame the BTC for Russia's continued covert involvement in regional latent conflicts especially the South Ossetian crisis which led to the Russia-Georgia war. 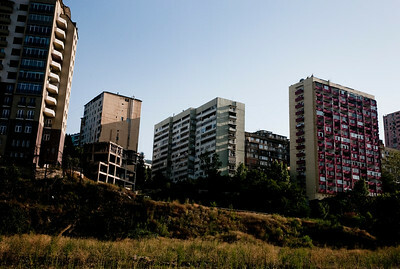 August 2011, Tbilisi, Georgia: Soviet style apartment buildings in the outskirts of Georgia. Since 2006 the BTC has allowed Azerbaijan to export its oil to world markets through Georgia and Turkey, thus avoiding Russia. It has given Azerbaijan a greater sense of independence and a new role for Georgia in Europe's energy security to the annoyance of Russia. Some blame the BTC for Russia's continued covert involvement in regional latent conflicts especially the South Ossetian crisis which led to the Russia-Georgia war. 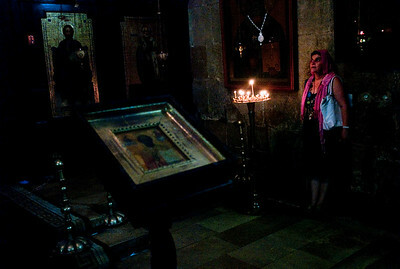 August 2011, Gory, Georgia: A pilgrim seen in an orthodox monastery near Gori, Georgia. Since 2006 the BTC has allowed Azerbaijan to export its oil to world markets through Georgia and Turkey, thus avoiding Russia. It has given Azerbaijan a greater sense of independence and a new role for Georgia in Europe's energy security to the annoyance of Russia. Some blame the BTC for Russia's continued covert involvement in regional latent conflicts especially the South Ossetian crisis which led to the Russia-Georgia war. 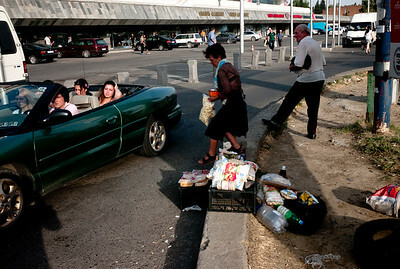 August 2011, Tbilisi, Georgia: Youth seen in their convertible near the train station in Tbilisi. The new oil money has brought in a divide between the rich and the poor. Since 2006 the BTC has allowed Azerbaijan to export its oil to world markets through Georgia and Turkey, thus avoiding Russia. It has given Azerbaijan a greater sense of independence and a new role for Georgia in Europe's energy security to the annoyance of Russia. Some blame the BTC for Russia's continued covert involvement in regional latent conflicts especially the South Ossetian crisis which led to the Russia-Georgia war. 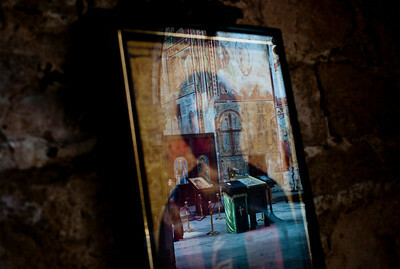 August 2011, Tbilisi, Georgia: A pilgrim seen in an orthodox monastery near Tbilisi, Georgia. Since 2006 the BTC has allowed Azerbaijan to export its oil to world markets through Georgia and Turkey, thus avoiding Russia. It has given Azerbaijan a greater sense of independence and a new role for Georgia in Europe's energy security to the annoyance of Russia. Some blame the BTC for Russia's continued covert involvement in regional latent conflicts especially the South Ossetian crisis which led to the Russia-Georgia war. 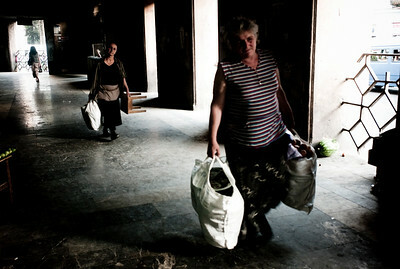 August 2011, Tbilisi, Georgia: Women walk with their shopping bags in a market area in Tbilisi. The new oil money has brought in a divide between the rich and the poor. 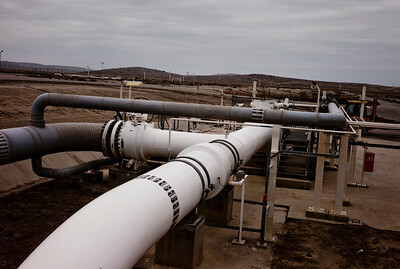 Since the flow of money has poured into Baku thanks to the Baku Tbilisi Ceyhan (BTC) oil pipeline. August 2011, Azerbaijan - View from the Tbilisi-Baku train. Since it became operational in 2006 the Baku Tbilisi Ceyhan oil pipeline has allowed Azerbaijan to export its oil to world markets through Georgia and Turkey, thus avoiding Russia. It has considerably strengthened good neighbourly relations between Georgia and Azerbaijan, although at the expense of both nations' relations with Russia.